Christmas trees are a crop, grown specifically for the Christmas market. The land they are grown on is often not suitable for other crops. A crop of Christmas Trees are a huge benefit to the environment. While they are growing they support life by absorbing carbon monoxide and other gases, and emit fresh oxygen in return. Growing Christmas trees on otherwise unused land also stabilises the soil, protects water supplies and provides a haven for wildlife, particularly birds. As the trees are cut in December the bird young are never disturbed and have long flown the nest. We often find old nests in the trees we cut. When we cut one tree another is planted next to the stump the following February, meaning that each square metre of land is sustainably doing its bit for the environment. An average 6 foot Nordmann Fir is 12 years old when cut. It has been grown in a nursery from seed for 2 years, then grown on outside for 2 more years. We buy our trees as these small (about 25cm) transplants from reputable, sustainable nursery suppliers, with full provenance of each tree. Your tree will have been pruned and weeded throughout its lifecycle, and kept free of all bugs to ensure it is healthy for December. Each tree grows in approximately one square metre of ground and we grow roughly 1000 trees per acre of land. The distance your tree will travel from being cut in Gulval to our site at Polgoon is approximately 2 miles. 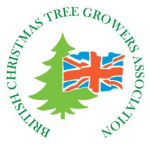 As BCTGA members we are required to comply with a code of practice so that British Christmas trees are grown to the best environmental and sustainable practice. Members are required to grow quality Christmas trees that with the appropriate care will survive the duration of their festivities. Read the British Christmas Tree Growers Association code of practice here.